BusinessCards Why you need the and how to use them! asking our advice about starting a pizza business! If you really want to learn the pizza business, you need to work at a pizza operation and get to know the business inside and out. Get a job at a pizzeria. Find a pizza place that makes great pizza and start working there! You want to learn to make fantastic pizza! I would think that in about 6 months you would know the operation. You also will know if making pizza for a living is what you really want to do. Making pizza is difficult, if you are turning out 100-200 pizzas a day. You will work long hours without much rest! You will make a few mistakes, but you will learn from each one! You need to go to "pizza school" and learn all that you can about making pizza. Talk to successful pizzeria owners who started out on their own personal budget. Learn all you can about the restaurant business. Research, study and ask questions! I cannot emphasize this point enough! It does seem very romantic to make pizza for people, but understand, it is challenging. The pizza business can be very lucrative but you do have to work, to make it a success! I have spoken to Gary Bimonte, (co-owner of Pepe's), a number of times about the pizza business. Gary grew up making pizza. He learned the business from his grandfather, Frank Pepe. Gary has stated to me how difficult the business can be. It is a life time commitment! Of course it is rewarding, but you will work long hours to be a success! Hang in there! 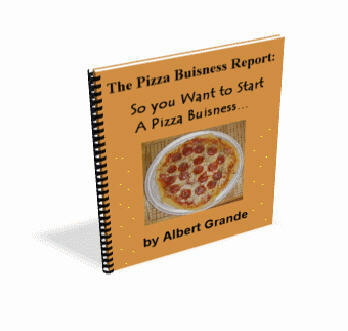 If you want to start a pizza business read on! If you are interested in Free Business Cards go here now. First, to get in the pizza business, you need research. Then, more research! You need to be willing to take risks. This list is double opt-in. You must confirm your e-mail address. "Your information will never be rented, sold or given away to anyone else. You can unsubscribe at any time." Get a copy of Legends of Pizza. Listen and learn. You will be inspired by listening to the Pizza Masters! of the finest pizza makers on the planet! This is available no-where else, anywhere, for any price!
" Research, learn and more research..."
Pizza and pasta tales, tips and talk. Pizza Marketing Quarterly, operates a web site for the pizza professional. They have many tips and offer a message board where you will be able to find answers and hook up with pizzeria owners. They feature Pizza Community resources, Industry information, and lots of ideas and resources for the seasoned pro or novice pizza maker! You need to visit this website! Another wonderful resource is Pizza Today web site. They also have fantastic pizza resources such as "front of the house", "back of the house", the "make line", and recipes! All of these are aimed at the pizza professional. You will find all kinds of useful information. The editors of this site are extremely knowledgeable about pizza and are willing to share their expertise. Check them out! These sites will let you post questions about dough, pizza recipes, pizza problems and solutions! Both sites publish great magazines, Pizza Marketing Quarterly and Pizza Today!. I subscribe to both and have found a wealth of information in these publications. I recommend that you also subscribe! Each issue is jam packed with Pizza information! The World Champions of Pizza have opened a video store. You can learn and see the inside secrets making pizza and purchasing pizza products. This is an incredible resource for anyone who is or is interested in being a pizza professional. Visit Tony G's, World Champions of Pizza Video Vault Here! Good luck to you on your quest for your own pizza restaurant. Please let us know if we have been helpful to you and if the above sites are able to answer your questions! I want to wish you the absolute best in your pizza adventures...I know you will be a success!!! Find an incredible listing of up to the minute Pizza Auctions happening right now in real time. with a wise man is worth a month's study of books." Make magic happen in your kitchen! Find the Best Pizza in the World!